We caught up with UFC fighter Kyoji Horiguchi to find out what his day-to-day consists of, including his down time fishing down by the river 70 miles north of Tokyo. In person, it seemed as if nothing could ever overwhelm him, whether it be the rigorous training he endures at the gym or the pressure to become the next UFC champion. It's obvious he has his eye fixed on the prize, and the wild parties thrown at the gym don't seem to distract him in the least. Remember to click "CC" (lower right of the video) for English subtitles. The button will show up after you push play. Since the downfall of PRIDE Fighting Championships, Japanese MMA has been on a gradual slump. There aren’t many Japanese fighters in the UFC in the first place and signed prospects like Hatsu Hioki have had disappointing performances so far. Due to the lack of star power, MMA has all but disappeared from Japanese TV networks. But there might be one exceptional fighter on the horizon that could follow in the footsteps of former stars like Takanori Gomi and Norifumi “Kid” Yamamoto. 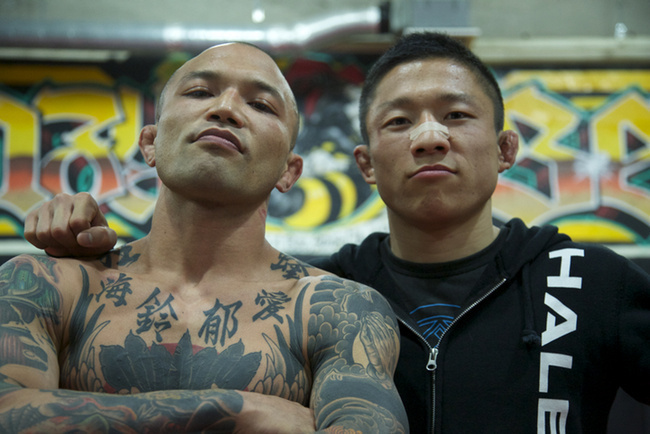 In fact, he is the training partner of Kid Yamamoto at the famed Krazy Bee gym. Kyoji Horiguchi sports an outstanding 12-1 record, with 8 of his wins coming by way of knockout. "My style is 100% Karate" says the former Shooto Featherweight champion, who contributes his unusual high knockout ratio to the traditional martial art. He started training Karate from an early age and soon participated in full contact sport Karate events. When he was 16 years old he saw a PRIDE event on TV for the first time and was immediately hooked. K1 Heroes super star Kid Yamamoto especially made a big impression on him. His ability to knock out far bigger opponents inspired the 23 year old Horiguchi, who himself is only 5’4”. At 18 years of age, the Gunma Prefecture native decided to become a professional mixed martial artist, much to the disdain of his parents. He packed his bags and left home straight for Yamamoto's Krazy Bee gym, where he has been training ever since. Soon after his pro debut on the local scene in 2010, Horiguchi started to wreak havoc, knocking out almost everyone in his way. The only blemish on his record came in 2012 to former Shooto featherweight champion Masakatsu Ueda, losing the fight to the experienced grappler Ueda by majority decision. But soon after, in 2013, Horiguchi was able to bank the Shooto 132 pound title by defeating Hiromasa Ogikubo in the second round with a choke. In October of 2013, Horiguchi made his UFC debut, defeating former TUF challenger Dustin Pague via second round TKO. Since joining the Krazy Bee gym, he has been a sparring partner of celebrity martial arts star Kid, who believes Horiguchi is the future of Japanese MMA. "I'm sure he will be champ one day. He will hold the belt for a long time," says Yamamoto, who lost to the current flyweight champ Demetrius Johnson in 2011 by unanimous decision. Even though Yamamoto is the older and more established fighter, he says he can learn a lot from the Karate based Horiguchi. Utilizing the wide stance of Karate to prevent takedowns, Horiguchi manages to hold the distance and close it with "no motion" in order to hit the opponent when he doesn't expect it. This makes Horiguchi one of the premier strikers on the planet, as Yamamoto claims. The teammates benefit a lot from training with each other and they are also somewhat dependent on it. In fact, most Japanese gyms don't have a head coach. "We pros give each other advice... but there is no one to point out the little details for us like what we're doing right and what we're doing wrong. That’s why athletes in the United States improve their technique much faster." To compensate, Horiguchi surrounds himself with high level sparring partners like Issei Tamura and Boku Kotetsu. Plus having an octagon in the gym, which you won't find in most Japanese gyms, makes Krazy Bee one of the best gyms in Japan. While MMA fighters were considered celebrities just a few years back in Japan, the image of fighters has changed in recent years in a negative way... so much in fact that Horiguchi wouldn't even want to tell his girlfriend what his profession was. "People think I'm loaded now, since I've made it to the UFC, but I still have a long way to go. I don't have much," says Horiguchi, who lives in a 20 square meter flat in Tokyo. It's hard to make a living as a fighter in Japan, since there aren’t many sponsors who want to invest in MMA at the moment. But all of that would change again if a new star is born... and Kyoji Horiguchi might just be that star. His next fight will be against Darrell Montague (13-3), who just lost against former Flyweight title challenger John Dodson. If Horiguchi wins this bout decisively, he might be in title contention within a year, which might just be the spark that brings Japanese MMA back to life.